I really enjoyed the show this morning - what fab demos Joanna did live on air. There are so many ways to use these stamps... here are the sample cards I made for Joanna. For this 8 x 8" card I created a stamped background with the rose designs using Tim Holtz distress ink. I used the Tied together embossing folder with black card for the edges with black gems. The 'suspenders' above and below the image are actually 'D' rings with ribbon, I coloured the rings with a black promarker pen. I stamped the bodice onto acetate with stazon, and also onto watercolour paper. I coloured in the watercolour paper image using distress inks then layered the acetate over the top. This card grew as I made it Lol! The wrap is vellum stamped with the rose stamp. The card underneath is white with coloured black edges with a promarker pen. The bottom flap is an additional piece of card folded, stamped and stuck to the back panel so that all 3 sides join to create the pocket for the card. I used the Frog fastner stamps to thread ribbon.. stamping white onto black card and cutting them out. I used a hole punch to make neat holes to thread the ribbon. I also thought that the frog fastner was great to pull the card out with, so I stuck them together back to back at the top. 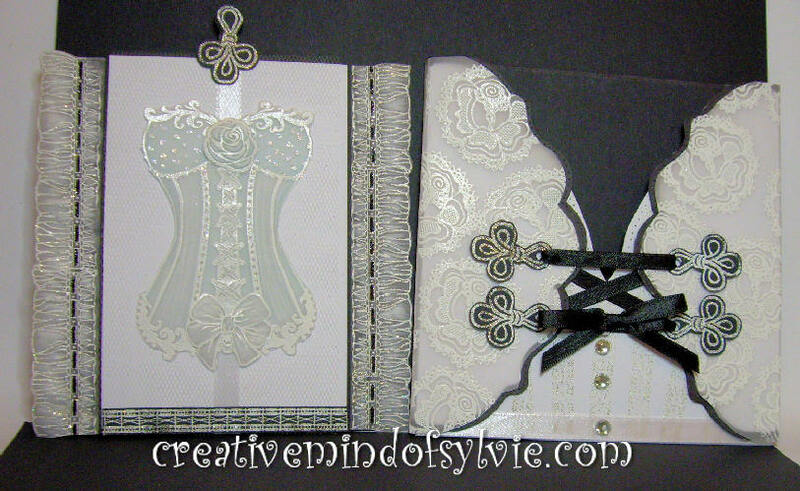 For the card inside the pocket I stamped the bodice onto vellum twice embossing with white embossing powder. I cut out the rose and bow from one for layers. I used the Aqua promarker pen to colour the back of the vellum to give a pretty glow then used a ball tool to emboss from the back adding tiny white raised details. I did this to the cut out bow and rose aswell. I glittered parts to add more sparkle. 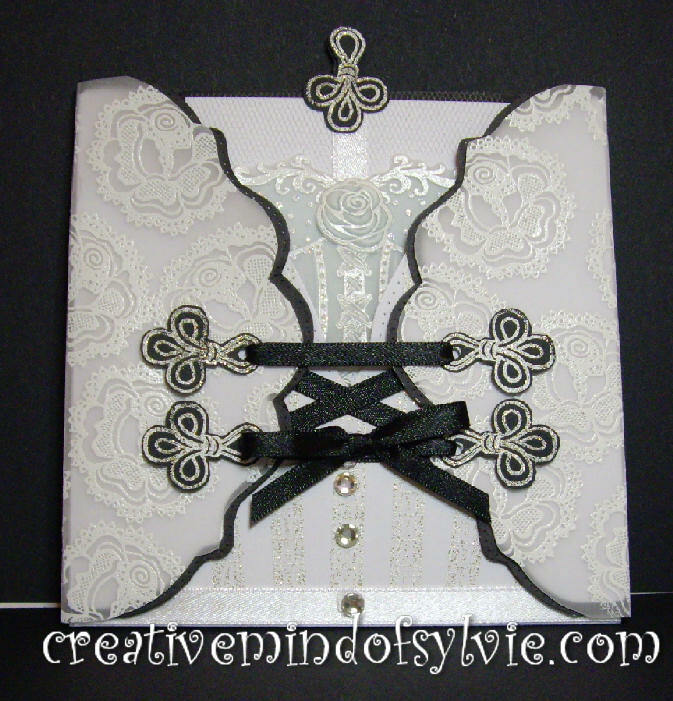 I covered a panel of card with some tulle netting and white ribbon down the middle and glued the bodice with pinflair glue. The lovely lace border on the sheet was stamped with gilded ivory powder on black card. 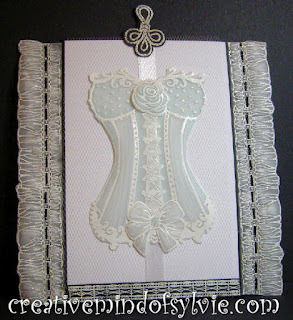 For each side of the frills, I stamped the frilly stamp twice in a line embossing again with white powder, cut them out and dry embossed on the back to add texture. Both these frills were stuck onto the card before adding the bodice topper. I used some black glitter to highlight the ribbon on the frilly borders. I adaped an old template to make the screen from one A4 piece of card, inking it lightly to age it a little. 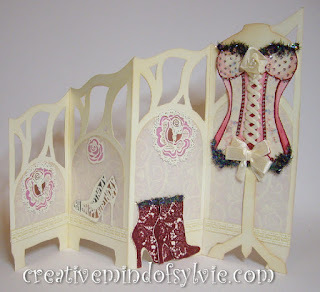 The bodice stand is a FREEBIE for anyone that would like to use it and is available at the end of this post to download. 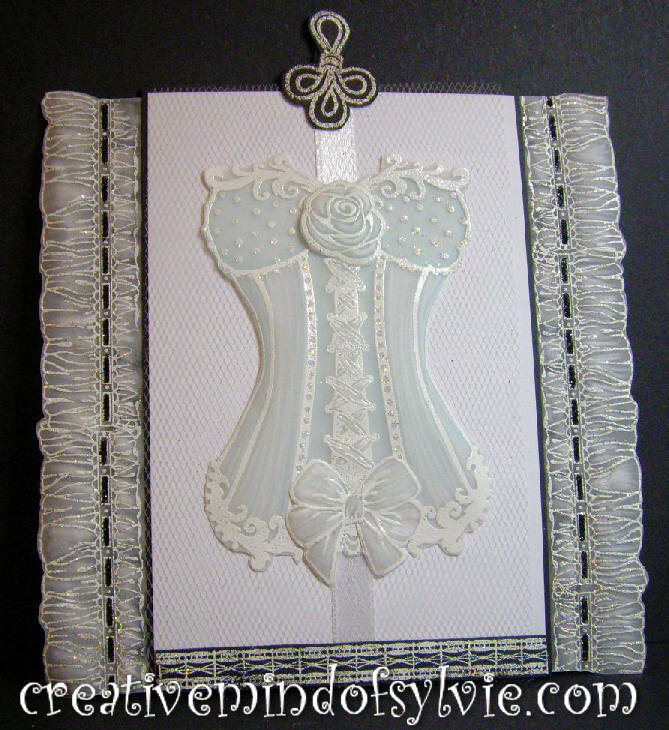 I stamped the bodice twice, one onto patterned paper embossing both. I cut out the patterned panels and paper pieced them onto the bodice. a promarker coloured the other parts. I puched tiny holes to thread the thin ribbon using the big bite then made a rose from ribbon (not a very good one, my first attempt LOL).. and a bow. As you can see I stamped the boots, embossing with red powder. The glitzy edgeing are sparkle fibres. I added tiny 1.5mm gems to the front .. that took ages Lol! 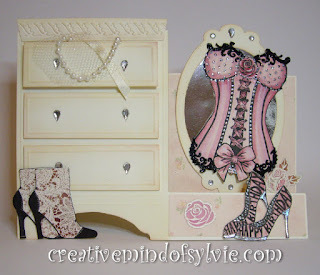 There are lots of places where you can get this idea and templates for side step cards on the web.. I added 3 rectangles, an embossed top panel and used one of my nesties to draw around and cut out the bottom of the chest of drawers. Little gems make pretty knobs. The mirror was created with spellbinders lable No.10 with an oval cut out and mirror board. The bodice has been stamped and coloured with promarker pens. I've used a glue pen to add foiling detail to the spots and the panels. The boots were stamped twice.. the lace part was embossed with white cut out and paper pieced onto the black stamped boot. For this card I stamped the lace border from the Live each moment stamp sheet directly onto the card down each side with black versafine ink. I am a big fan of paper piecing the bodice because it adds so much more that just colouring it in. 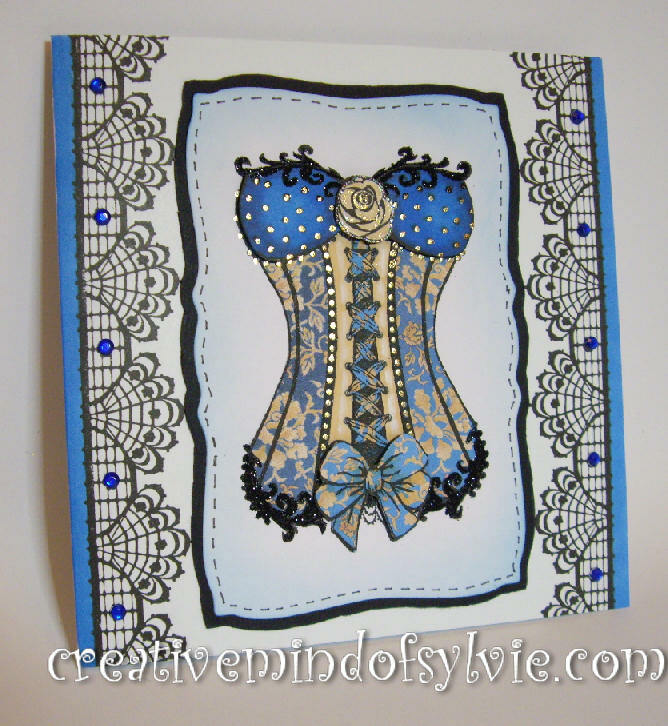 I've used two extra stamped bodices, one on blue pattern paper and one onto a matching beige colour. the top part has been coloured with Asure promarker pen, I've also coloured the sides of the card with the same colour. I've created gold dots using a glue pen and gold foil. Here's the FREEBIE for you. You should be able to print it out, cut out and use. I have tried to make it the exact size to hang the bodice onto. here it is.. click onto the picture and save to your computer. Thank you for visiting my blog today.. I will be adding the Natures Lace stamp samples later today or tomorrow..
Oh wo these samples are amazing and I am sure they will sell out. Thank you for the freebies. Also, thanks for showing us the card that you made. there are all beautiful. Wowzers! Where were these when I was selling UndercoverWear? They'd have made great thank you cards for my hostesses LOL. Thanks for sharing. Thanks - going to be most useful! Love the cards...thank you for the great freebie!! !